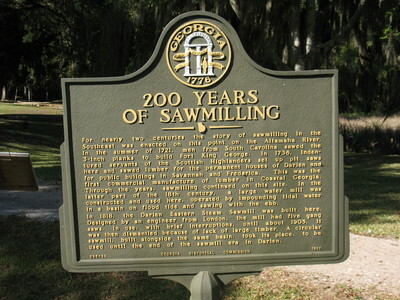 "200 Years of Sawmilling Historical Marker, Darien, GA" by George Lansing Taylor Jr.
200 Years of Sawmilling Historical Marker, Darien, GA. This marker is located inside the Fort King George Historic Site on Fort King George Dr. in Darien, Georgia..
" “For nearly two centuries the story of sawmilling in the Southeast was enacted on this point on the Altamaha River. In the summer of 1721, men from South Carolina sawed the 3-inch planks to build Fort King George. In 1736, indentured servants of the Scottish Highlanders set up pit saws here and sawed lumber for the permanent houses of Darien and for public buildings in Savannah and Frederica. This was the first commercial manufacture of lumber in Coastal Georgia. Through the years, sawmilling continued on this site. In the latter part of the 18th century, a large water mill was constructed and used here, operated by impounding tidal water in a basin on flood tide and sawing with the ebb. In 1818, the Darien Eastern Steam Sawmill was built here. Designed by an engineer from London, the mill had five gang saws. In use, with brief interruptions, until about 1905, it was then dismantled because of lack of large timber. A circular sawmill, built alongside the same basin, took its place, to be used until the end of the sawmill era in Darien." This waymark is on the grounds of the Fort King George Historic Site. Taylor, George Lansing, Jr.; Lance Taylor; Photographers -- Florida --Jacksonville; Photograph collections -- Florida -- Jacksonville; Sawmilling Historical Marker; Fort King George; Darien Eastern Steam Sawmill; Sawmilling; McIntosh County (Ga.); Historical marker --- Georgia --- Darien --- McIntosh County.